Our next First Friday Art & Wine Reception on Mercer Island is on May 4th from 5 – 8 pm. Stop by for some conversation, complimentary refreshments, and live music! The featured artists for April and May are Laura Castellanos, Juan Carlos Castellanos, and Robert Wood. The three artists’ works will be available for purchase until the end of May. The musical accompaniment for the evening will include a performance by father-daughter duo Benoît and Carla Mory. They will be performing Bach Aria on the flute and harp, respectively, and Carla will play a harp solo of Bernard Andrès' "Amarante." 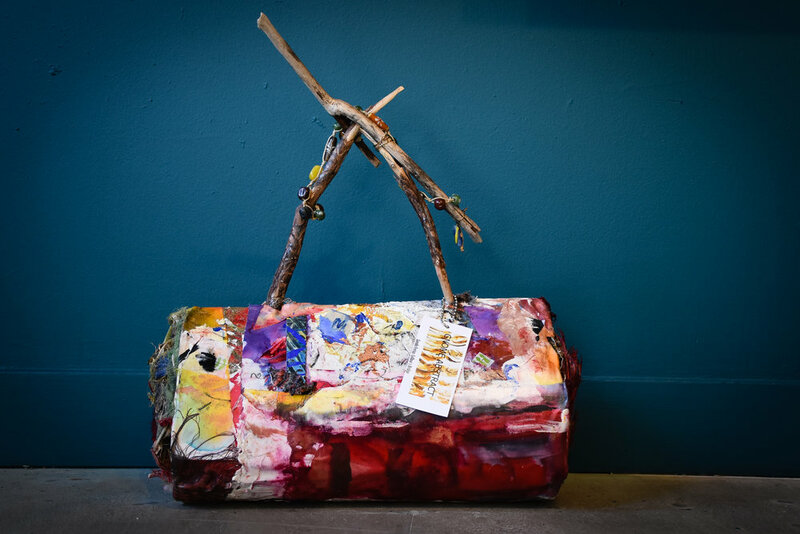 The pieces by Cuban-American artists Laura and Juan Carlos are part of their first visual collaboration previously featured at Gary Henderson Interiors in Seattle. In a brief interview with the artists, they explained that they combined their unique styles by approaching the collaboration “as a kind of conversation between two artists paying homage to traditional modernists painting[s].” The inspiration behind these pieces came from the act of creating the art itself. These collaborative pieces were created “as if we were a couple of jazz musicians improvising and ‘riffing’ off each other.” Laura and Juan Carlos also share the same influences and ideals about art. 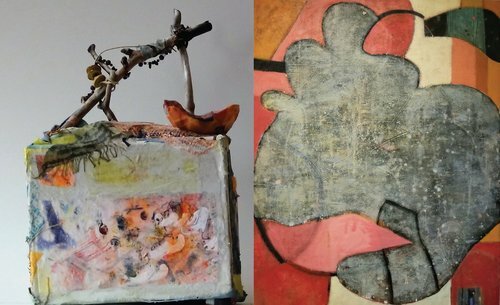 Laura and Juan Carlos’s unique collaboration will be exhibited alongside Robert Wood’s “Left Luggage of Gnome Island.” Robert, an artist on Lopez Island, has been creating Mixed Media artwork for over 20 years. His exhibit at SZ Gallery will feature a whimsical narrative revealing the story of travelling gnomes. To learn more about his exhibit, I sent a few questions along to Robert – read on for his Q&A! Julia Hess: First of all, why gnomes? Robert Wood: Gnomes were selected for their diminutive size, outrageous aesthetics, fun loving nature and desire to remain a bit hidden in the landscape. It is a snapshot of a wildly different way of life and an invitation to the viewer to suspend expectations around a "constitution of aesthetic beauty." It is a limited collection of 36 pieces. JH: What themes or motifs inspire you the most when creating your work? 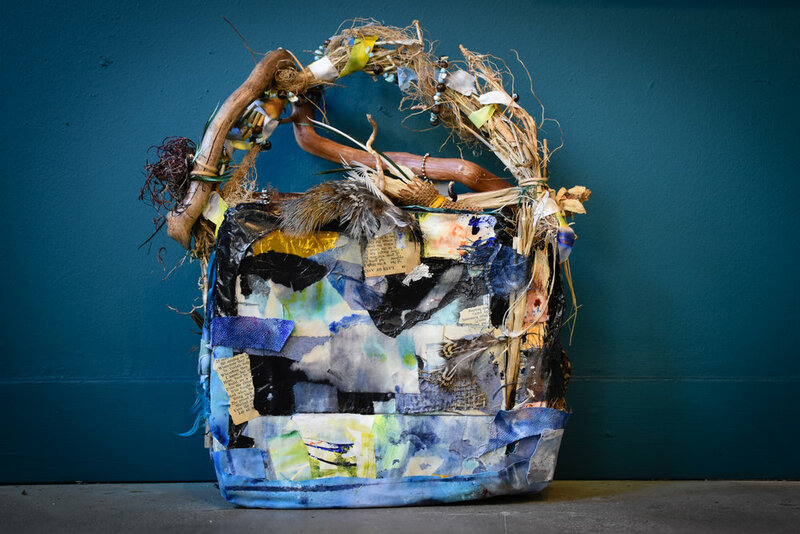 RW: The themes I most like to explore involve nontraditional views of beauty, invoking new perspectives on familiar objects and the marriage of abstract images and natural materials such as bark, plant tendrils, nest materials and beach floss. I carry these themes out in sculpture, collage, and shadow box works. JH: What does the “left luggage” represent? RW: The Left Luggage of Gnome Island tells a story of 36 Gnome travelers who cross Callow's Bridge to Infinity and vanish into thin air leaving only their luggage behind. It is a statement on the impermanence of objects from the perspective of infinity and a cultural reveal of life on a remote fantasy island with its own unique history and characters. The luggage was" left behind" as it was no longer needed once the travelers crossed the bridge. JH: How do your surroundings on Lopez Island inspire your artwork? How does this work into the map of Gnome Island? RW: Island life engages a certain myopic focus reinforced by geography which feeds the growth of an island culture all its own. One knows their neighbors on a small island. Anonymity does not exist here. Gnome Island is a parallel reality to Lopez Island. While there are no specific similarities, I endeavored to make Gnome Island an interesting island with absurd amenities like a theme park and railroad. As I developed descriptions for the luggage, a narrative unfolded based upon the lives of the original luggage owners who had vanished. Come see Laura, Juan Carlos, and Robert's art at SZ Gallery from April 6th to May 31st. You can also view their artwork on the SZ website.